Adam takes a look at the much-maligned Memoirs of an Invisible Man form director John Carpenter. The new Scream Factory Collector’s Edition puts this film’s best foot forward and makes a case for any fan of sci-fi mashups to give this one a second chance with a great transfer and thoughtful special features. If you like or dislike Carpenter’s shot a big budget legitimacy, one thing is for sure; it’s damn good looking and technically dazzlingly filmmaking. Memoirs of an Invisible Man is Carpenter at the peak of his skills as a technical filmmaker. The film is only hobbled by an inconsistent script and a leading man that could never find the right tone which wasn’t his usual go-to WASP-y Snark. Successful Prick-about-town Nicky Halloway (Chevy Chase) lives the clichéd life of a late 80’s to early 90’s Stockbroker/Venture Capitalist douche bag. Great apartment in San Francisco, great job, booze, coke (not the kind you drink), membership to an exclusive Men’s Club, everything that certain people of a certain age, creed, and disposition could want. After a screwball meet-cute with Alice (Daryl Hannah), Nick drowns himself into a booze-fueled stupor. Why do you ask? Because the D-Bag couldn’t bed Alice. Respecting herself to not sully her reputation she rebuffs him and gives him a Friday Lunch Date instead. The next morning in a hungover stupor Nick manages to make his way to an important tech conference for his work. Before Nick realizes what has happened the Facility that said the conference was in befalls a terrible accident (as they do in these stories) that ends with Halloway invisible. What begins as an attempt to be a throwback to the 30’s and 40’s Rom Coms quickly becomes a Michael Crichton-esque Techno Thriller complete with Government Agents on the hunt for a now very valuable asset. The biggest issue with the film is the script’s tone-deaf attempts at making Nick Halloway into a Chevy Chase “character”. From a Murder’s Row of screenwriters that includes Dana Olsen, Robert Collector, and William Goldman you would expect more, a lot more. Though the film is tightly constructed the characters, specifically Nick, are clichés. It feels as though they were making attempts at a throwback to the Golden Age of Screwball Comedies. Halloway being a role that Cary Grant or William Powell would have played. Unfortunately, the script took the wrong lessons from the Comedies of that era and the results are tonally problematic at points. What began as a charming flake in Ty Webb morphed into Fletch to smashing good effect finally landed as a sexist self-parody in Nick Halloway circa 1992. 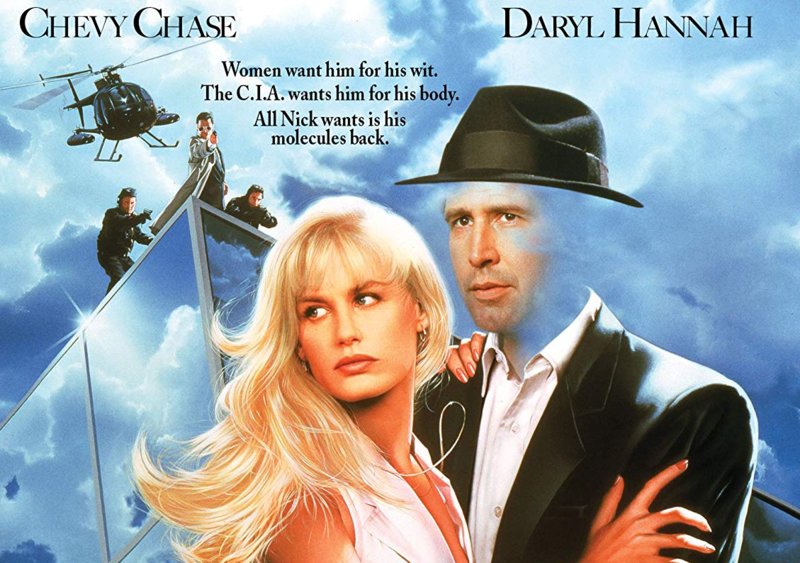 Chase is great when he’s not trying to be “Chevy Chase”, which is primarily an issue within the first 15-minutes. Once the film begins proper there are only mild moments of Chase-isms. One can almost see the fear and panic set in Chase as an actor realizing that Halloway would need more than pratfalls and WASP-y low key charm. That fear pushes him to rest on tired and true Chase shtick. Though Carpenter is able to work through the short first act to get a less fettered Chase performance, it will leave one wanting more of this kind of performance from the comedy legend. The script makes much better use of Sam Neill as Jenkins, the covert CIA Spook wanting Halloway for nefarious deeds. So convincing is Neill, one will find themselves rooting for Jenkins to catch Halloway and put him to use for the greater good. The actor is all charm and swagger in the role. Even in the silliest of moments, when a gun is essentially glued to his head, Neill brings a verisimilitude to the proceedings. So much so you can’t help but applaud the actor and want the character to succeed in his mission. Director John Carpenter is in full Hawksian mode here. Memoirs of an Invisible Man plays out like something that Howard Hawks would have directed fifty years prior. The film aspires to be a heady brew of Screwball Comedy, Romantic Thriller, and Science Fiction done with the kind of flair for dialog and character that Hawks was known for. It is unfortunate that even under Carpenter’s sharp direction the film never quite lives up to the Hawks style of filmmaking. For a film that is set in one of the more Iconic cityscapes in the US, Carpenter still finds those great flourishes that make for a Signature Carpenter film. The way he is able to lens shoots and utilizes San Francisco is a textbook case of how to show off a City and its unique visual aesthetics. Memoirs of an Invisible Man is not a classic. Nor is it the much-maligned critical punching bag its become. The movie lies somewhere in between. Finding its footing in the last two-thirds and having a great Sam Neill performance. Ultimately, a film that is an interesting semi-success people will find more to like than they initially thought. The new 2K Scan of the Original Film Elements that was done by Scream Factory/Warner Bros has resulted in a beautiful transfer. The disc is a showcase for the San Francisco setting and the early Computer Effects from ILM. This new transfer shows off the Anamorphic image that Carpenter specialized in for the bulk of his career. Cinematographer William A. Fraker’s lens flare filled photography is razor sharp even during the Effect set pieces. Bravo to Scream and WB for navigating what had to be one of the trickier Transfers of recent memory. How To Become Invisible: The Dawn Of Digital F/X is a 5-minute featurette showing how they did some of the Digital FX work. It’s a fascinating look at the literal beginning of Computer generated effects. What makes the featurette so interesting is the lengths they went to to achieve the work they did. The Behind the Scenes Footage much like the B-Roll footage from In the Mouth of Madness is fascinating because of the “fly-on-a-wall” nature. It amounts to about 3-minutes and it mostly concerns the half-invisible building set which they actually built a bulk of. Again interesting albeit short look at how they achieved specific effects in the film. The Outtakes amount to 2-minutes of brief moments. They include an extra dream sequence, and additional moments at the beach house, further extending the gag of Chevy dropping things. Fun to have on the disc but definitely doesn’t bring anything to the proceedings. Again, Scream Factory has included vintage featurettes, trailers, and TV Spots to this disc like they have for In the Mouth of Madness. What’s become one of my favorite pieces of these Scream Factory collector’s edition are the vintage featurettes, TV Spots and Trailers they managed to find. This edition does not disappoint as they include all three. The Vintage on-set interviews with Carpenter, Chase, and Hannah are great because they’re so 90’s. All great cheeky fun! Though not a masterpiece by any means, Memoirs of an Invisible Man is fascinating. This early 90’s sci-fi big budget film is aided by a master of Genre filmmaking at the helm and a truly great Sam Neill performance. The surprisingly in-depth special features aid in making this a disc to own. Recommended.